Check back for updates on the next Women’s Health Series in fall 2010! The Women’s Health Series is a 6-session popular education and action series that addresses common themes in women’s health. The series is designed specifically to build the health skills and knowledge of women fighting for healthy communities and social justice. Our understanding of women’s health starts with the basic struggles and experiences of women’s daily lives. Low-wage jobs and the tasks of raising families and accessing services leave many women without the energy to attend to their own health needs. Sharing stories of hardship empower us to see our own individual experiences as problems common to many working-class women locally and around the world. 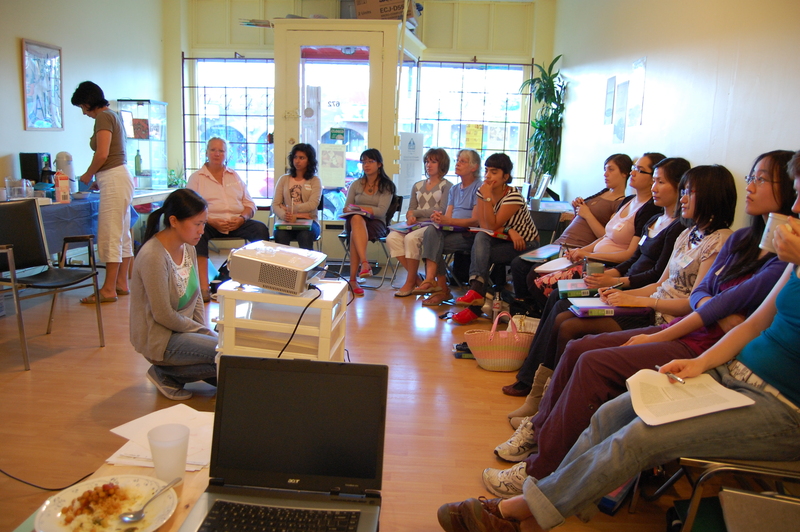 Each workshop is designed to draw out those experiences, to learn about and discuss the roots of women’s health problems, and to receive practical tips and information on how to overcome stress, anxiety, gain control over our sexual lives and access low-income health services. We intend that these practical skills and knowledge will allow participants to take their own health and the health of their communities into their own hands! 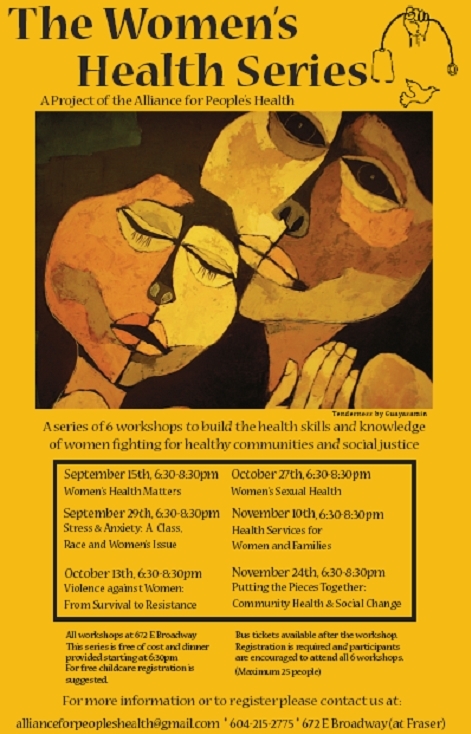 Women’s Health Matters: The introductory session, it is intended to give an overview of the six workshops, and to broaden our understanding of basic concepts that impact women’s health such as class, racism, exploitation, patriarchy, and sexism. Stress & Anxiety: A Class, Race, and Women’s Issue: Participants share and evaluate how their position in society impacts their integrity, sense of security, control over their lives, and their mental health. Some practical strategies and tips to help cope with stress and anxiety are shared. Violence Against Women: From Survival to Resistance: Discuss the different ways violence is perpetrated on women by society, and how this violence impacts their lives and health. Participants will discuss how women are fighting back to change society and liberate themselves. Women’s Sexual Health: Discuss the sexualization of women, how women’s sexual health is a class and race issue, as well as how we can reclaim and take control over our sexuality. Health Services for Women and Families: Review a brief history of the Canadian health care system and find out what services are available for you and your family. Putting the Pieces Together: Community Health & Social Change: A sum up of all we have shared and learned through the series together. Learn from international case studies how communities are making positive change in the community and society as a whole. If you would like more information on the Women’s Health Series, please e-mail or call the Alliance for People’s Health.